Yes, public sector tweets can be exciting and interesting! In the public sector, we often have small, or no, budgets for social media. But our organisations do amazing work and our communications teams have bags of talent. I salute communications professionals in public services and government, and I want to say thanks for keeping us all informed and entertained all year. To highlight some of the good work going on, here is my top ten of public service tweets of 2017. They come under headings: tone, using Twitter functions cleverly, threads and nice messaging. This one needs some context. Assistant chief constable Rich Lewis shared a nice snap of some police and air ambulance mascots at Pride Cymru. An on-brand tweet that I’m sure aligns with both organisations’ commitment to equality and diversity. A follower, Graham, replied, taking the line that these public services should only spend time rescuing and police, not being at such an event. Leaving my personal thoughts about this aside (ONE LOVE! THIS IS A HATE-FREE ZONE! ), let’s think about the response. Funny, sarcastic and confident. I guess their communications plan must be strongly linked to clear objectives, around recruiting a more diverse workforce and making existing staff feel valued. Thousands of retweets later, it’s safe to assume that many people loved their response. One unfortunate thing that happened as a result of this, is that, as people shared and celebrate this sassy response, Graham Down got a whole lot of stick from the people of the internet who became aware of his response. I would worry about this when making the decision to reply as they did. The consequences are not all positive. However, as a local and person and someone who actually worked with Councillor Down in my local government days, I suspect the tweeter was aware of who he is and judged that he’s equipped to handle the debate and attention. This tweet not only increased awareness of the organisation’s commitment to diversity, increased their follower count and gave people a chuckle – it had a real-world outcome to the tune of £250 in donations. Not earth-shattering, but shows that sometimes reputation-building can pay off very quickly. Don’t forget to turn back time tonight. Cher is one of my all-time favourite tweeters. This tweet just made me laugh. And as well as getting a little reminder out there, it showed that this fire brigade understands internet culture. This is actually really important – when you have a team that understands how and why people share online, you know that in emergency they are capable of getting vital information out quickly to the widest possible audience. Also: Cher. I love her. Orkney Library are veterans of friendly and creative tweets. In emojis, it shows the breadth of the ways libraries help people expand their knowledge. This tweet gives people a chance to share this with their followers, and by doing so, show the world that reading, and free access to libraries, are an important part of their identity. We are DELIGHTED to be able to confirm what our new gritters will be called, following the #DoncasterGrittingWorldCup final! We all remember the Boaty McBoatFace episode. The question it raised for me was: ‘why would you go to a place where lots of smart people go to be silly, make pun and have a chuckle, if you don’t want funny answers? Doncaster Council showed much social media savvy with this one. Public sector tweets don’t have to be humourless. They understood from a previous local government competition, that people get excited about the idea of naming a gritting vehicle. So they turned on their sense of humour and used videos and the Twitter poll function to run the #DoncasterGrittingWorldCup. Of course there will be rude, entries, moaning about council time mis-spent – the usual. But nothing worth doing pleases everyone. This tweet is part of a whole bunch of tweets that let people get involved and that engaged a community is a fun way. Everyone on Twitter was talking about the expansion of tweets from 140 to 280 characters. Sussex Police may not have expected how much people would love their addition to this worldwide debate, but a simple tweet turned into a sensation and spawned a number of replies and tributes. This may not have the fun factor, but it’s got two factors that make it an ‘arresting’ tweet. First of all, it’s about thanking the audience instead of patting itself on the back. Too much comms is only about telling everybody how wonderful the organisation is, like some self-obsessed big head. Gratitude makes Surrey Police more likeable. The best corporate social media is social, and behaves like a functioning human. Read more on this in my post about social media psychopathy. Secondly, it uses video. Instead of a written statement on a website, that we have to click through to read – we get a video and see the message straight from the source after the court case. It’s quicker to take in, that text posted elsewhere, it’s more attention grabbing in our timelines, and it’s from an actual person we can see and hear. There are not enough humans representing their organisation on social media, if you ask me. Police forces must build trust to ensure people want to come forward to them to report crime, and to reassure people that they are protecting us very day. Over time, lots of these human tweets add up to a happier society. Using Twitter cleverly means really understanding Twitter. Sure, you can come and learn more on one of my social media classes. But when you use Twitter yourself personally, and you work in comms – it shows. 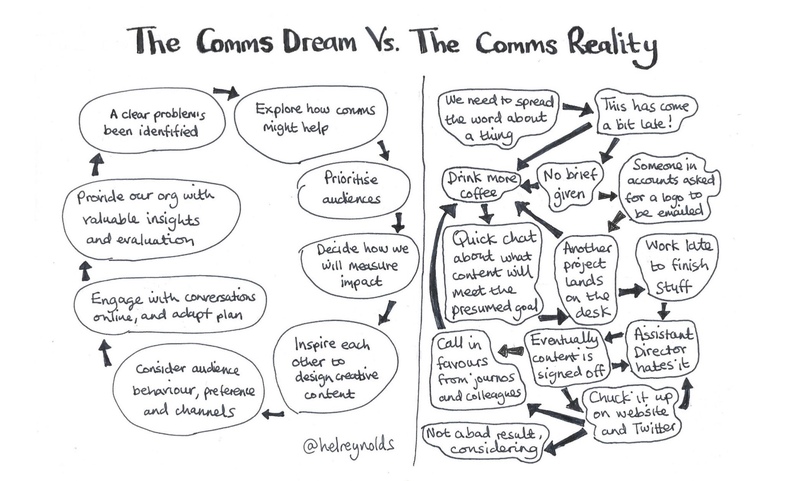 The best tip I can give to comms professionals is to consume more than you create. This related to tone, it’s about being relevant and ensuring your comms is appropriate for the medium. Those of us who are Twitter power-users, will know all about ‘the thread’. A Twitter thread links many tweets into a story. They’re used by journalists authors and other storytellers, and often include gifs to add humour and visual cues of emotions felt. This is a great example of smart problem solving. Lots of people asked about, and had misconceptions around the issue of asking for black blood donors. They made a complex explanation easy to understand and share, by using a thread that broke it down into chunks. This Doncaster thread gets the issue of fly-tipping across is a fun, very Twitter way. Taking an unusual incident, adopting a cheeky tone, helping people see the issue from the perspective of a council officer. And generally sounding like the council belongs on Twitter, rather than a organisation pumping out press releases and hoping they’ll, um, fly. I feel very ‘positive’ about this tweet. This was a concise, creative way to help people understand how types of blood get donated. The visual way it’s explained beats a text explanation. It gets an A+ from me. Somehow this video manages to be dramatic and reassuring at once. And if I was on the fence about donating, this catalogue of expenses would really help persuade me that money is well spent and sorely needed. What did I miss? Have you got any other good examples?